School Principal Khalim Ali (right) stood proudly with Shahanaz as she was presented a tall elegant trophy by Juliana Jovan-Boodram, Deputy Permanent Secretary in the Ministry of Planning, Housing and the Environment. “MANAGING Squatter Settlements in Trinidad and Tobago — Towards Sustainable Development” was the theme of a Schools’ Essay Writing and Debating Competition jointly organised by the Ministry of Planning, Housing and the Environment, the Land Settlement Agency, the Environmental Management Authority (EMA) and the Ministry of Education. The essay competition was won by Shahanaz Alex of Warrenville TIA School, with Anslim Villafana of Curepe Presbyterian in second place and Buenos Ayres Government student Kayanthy Sherwood in third place. Naparima College topped the debate segment of the competition, with Vishnu Boys High School second and Cowen Hamilton Secondary third. 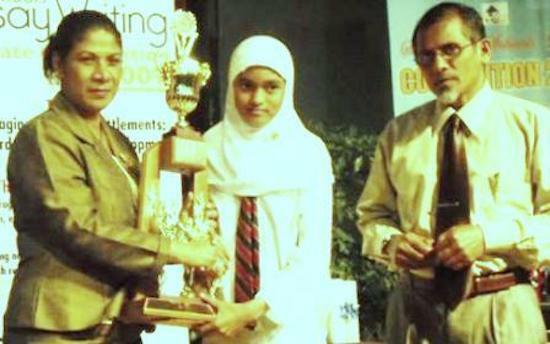 Be the first to comment on "Trinidad Muslim Student wins National Essay Writing Competition"